Residents in New York say they’re alarmed after seeing “Muslim Community Patrols” driving through their neighborhoods in what look like police squad cars. One America News Network’s top investigative correspondent Pearson Sharp has the details. 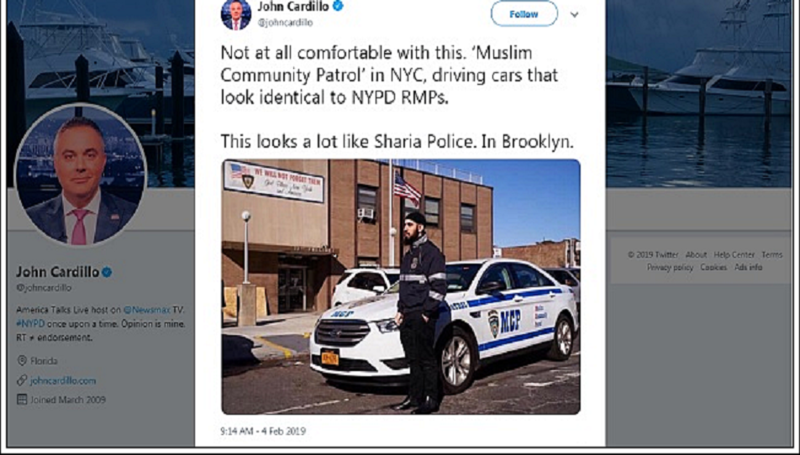 Muslim patrol cars in the City of New York are now taking to the streets of the Big Apple thanks to the leftward trend of the Democratic Party.. While it may appear unbelievable that this mercenary police force has received the blessings.of out-and-out communist Mayor Bill de Blasio. “Imagine the outrage if a Republican mayor decided to allow Christians to start their own police force with the purpose of protecting Christians and Christian Churches. Imagine the news media’s reaction to patrol cars with Christian symbols positioned next to the words police. I dare say even Catholics and Protestants would complain about the violation of the First Amendment,” said former NYPD Inspector Thomas McNally and Sergeant Melvin Davis. “Once again, Mayor de Blasio is insulting New York’s Finest just as he has done in the past. During the civil unrest that occurred during President Barack Obama’s administration, de Blasio went as far as telling New Yorkers and the nation — with the help of the news media — that he instructed his son, who is black, that he should be careful if he faced police officials. Young black males are being told not to trust law enforcement,” a former police detective now teaching criminal justice at a local college.